"Back to serious time, now with better rain"
Forza Motorsport 5 was a decent racing game for the Xbox One's launch two years ago. It wasn't as feature heavy as past Forza games due to trying to make it ready to the console's launch, but free cars and downloadable tracks were later added in the following months. 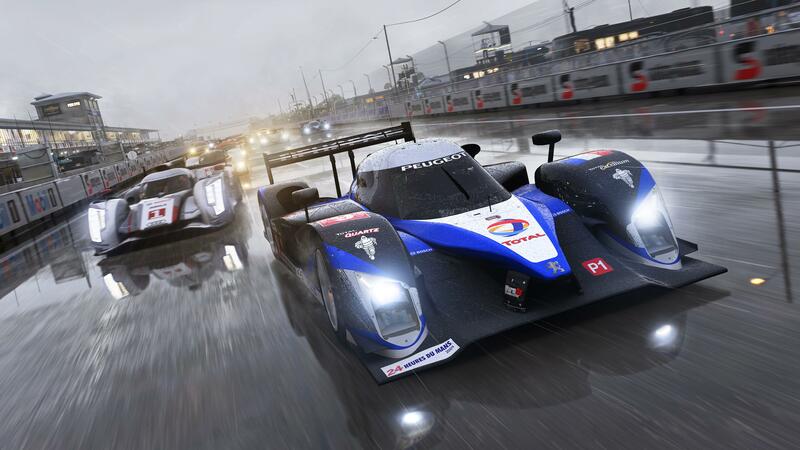 Now with more time, Turn 10 Studios is back with Forza Motorsport 6. They did learn some things from the last game from turning down on the microtransactions, including prize spins from Playground Games's Horizon 2 and adding night races along with rain. However, a similar, grindy career structure, the serious movie trailer tone in the music being back compared to the upbeat tunes of Horizon 2 and online races still not being fun due to the "bumper car" mentality, Forza 6 feels like deja vu, but the driving itself is still arguably the best in the genre. After playing a tutorial race at Rio de Janeiro with the game's cover car, the 2017 Ford GT, you're jumped right away to the career mode, called Stories of Motorsport where the narrator introduces the five volumes. These volumes are super sport, sport icons, grand touring, professional racing and ultimate motorsport The next volume up can be unlocked when you bet at least one category, so career mode can beaten in a few hours by just doing one of each. 100%ing it does become a grind, to the point a chore, like most simulation racers. Each category does get an intro by automotive journalists such as the Top Gear guys minus Jeremy Clarkson, but it's weird that the Top Gear rights are still being used for this game with the current situation those guys have now. Driver progression remains the same from Forza 5 where there's driver level XP, affinity level and credits to buy cars. New to Forza 6 however is the mod system where players can buy card packs to buff up their XP earned, braking, grip, power, etc. It's a worthwhile addition and one of many examples the game just gives you opportunities to get the fast and expensive cars more quicker than normal. With getting lucky at prize spins after gaining a driver level up and keeping tabs with the Forza Hub app, you're likely never out of credits to buy a car or have a car suited for a specific category. Just by playing Forza 5 and Horizon 2 alone, I started Forza Motorsport 6 with over two million credits and tons of fast cars rewarded for my garage. Forza 6's driving mechanics and physics remain the best in the business compared to the current crop of simulation racers. Sure, you can fine tune your driving style in terms of assists you want on and off. The instant I can limit my driving line to just turns only and braking not being automatic, I did that in a heartbeat. There's still rewinds as well if you messed up a turn or got involved in a nasty collision. The addition of night and rain definitely changes my mental state towards races. Your vision is limited in both settings, but the usage of rain and puddles is a game changer to the genre. Turn 10 was hyping up their efforts handling rain throughout the game's marketing cycle and boy they backed up their talk exceptionally well. Hydroplaning on puddles can become disastrous especially with a turn coming up and you weren't prepped it in the rain. Plus the feedback you receive with the Xbox One controller's rumble triggers in those situations remains unrivaled in any other Xbox One game out now along with braking before turns and going off-track. Drivatars from the last two Forza games are back and act as you expected them to be. They'll mess up every now and then along with being aggressive when they should if the other players want them to be. Even with the system introduced a couple years ago, I still think it hasn't lived up to it's full potential in terms of really being true to your driving tendencies. Perhaps the majority of players have that aggressive and occasionally screw up a turn, but then again the game has only been out for a couple weeks (especially for those that had early access thanks to the Ultimate Edition). Besides the career mode in Forza Motorsport 6, there's also showcase events reminiscent of previous games where you drive specific cars in certain challenges. Similar to the last game, there's passing challenges, navigating through a tight driving line, accumulating a high score driving through bowling pins and endurance races that take about a hour to beat. Free play, photo mode, replays, car tune customization and car painting are also still in and great in typical Forza fashion. Then there's the online play and if you're familiar with racing games online, they never change and Forza Motorsport 6 is no exception. The hoppers from Forza 5 are back from specific cars to car classes, but with up to 24 players on the field, there's always a chance for chaos from the first turn to the end of the race. Fortunately, there's hoppers as of this review with no collisions if you don't want to be involved in the "bumper car" mentality. Besides that concern, the netcode is fine even though you'll find a player being laggy every now and then. New to Forza 6 are leagues where you get ranked on a limited time hopper. Rivals also return where you can challenge friends and drivatars' times in the various tracks. The online experience in these games tend to rely more on luck than skill and it can be frustrating as it depends whether or not you're patient to endure those unlucky races. 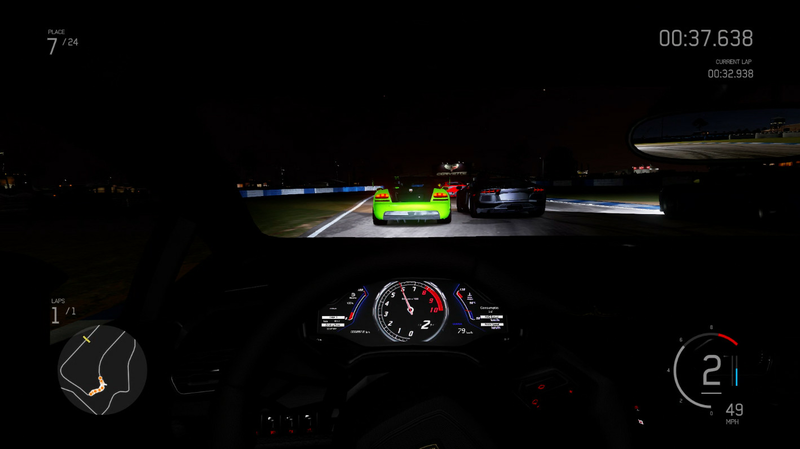 Forza 6 is indeed one beautiful looking game whether you're racing during the day, night or in a rainy setting. Many beautiful locales such as Prague and the Alps return along with the free tracks that came after Forza 5's launch such as Long Beach, Monza and the Nurburgring. The action runs consistently well at 60 frames per second especially in the rain. It's always thrilling tightly passing cars using the cockpit cam in such intense settings such as the gif above. The cars themselves still look amazing and that's not a surprise coming from Turn 10. However, going back to serious time with the music is a disappointing. The epic movie trailer or climax-esque direction with the tone of the music just doesn't do it for me. I usually either listening to a podcast or more upbeat music from my phone or have a Twitch stream snapped as background noise while grinding out these races. I get that Forza 6 is an "epic game" from Turn 10 and needs epic music, but cmon guys, for the second time more energetic stuff next time please? I guess there's the Horizon games for that. For the franchise's 10 year anniversary, Turn 10 definitely stepped it up for Forza Motorsport 6 in certain areas and new additions, but yet it still feels like deja vu everywhere else. The driving still feels fantastic and arguably the best in the genre along with the best usage of rain yet in a racing game, but the grindy career mode, online play being frustrating to deal with depending on players' skill levels and the serious tone in music returning keep it from being more superb. Racing fans should still buy this solid sequel and there's enough content to keep you busy for months.